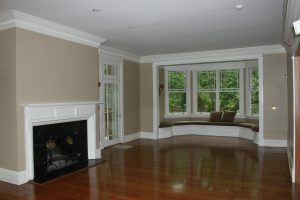 At Monk’s Home Improvements, we’ve been painting & repairing homes in Madison, NJ since 2007. We’ve grown to include additional home improvement services like custom closets and kitchen remodels, but painting is the core of our business. We thoroughly prepare all surfaces and take care to protect your furnishings. We pride ourselves in delivering you a painting or carpentry job that you’ll enjoy for years to come. In fact, we guarantee it. Travis Marion manages all of the Monk’s Home Improvements projects for Madison, NJ. Travis spent his first day working on a construction site when he was 13 yrs old. He has spent many more days since then doing and managing all types of remodeling and home improvement projects. Travis lives with his wife and three children. A little boy was added since this picture was taken! Travis looks forward to discussing your interior painting, exterior painting or carpentry project with you. Call to schedule an appointment for a free, written, on-the-spot estimate with Travis Marion. Travis will tell you why we are the best painters and carpenters in Madison NJ! Removal of all loose paint, even if that means removing 95% of the paint from the siding. Two top coats of paint. One simply isn’t enough. For cedar houses with lots of bare wood, we apply a 2nd coat of oil based primer to prevent staining. We can paint kitchen cabinets, railings, trim, cedar shingles, fences, decks, sheds and more! Call 973-635-7900 today to schedule an appointment with Travis to discuss your painting needs.